Description: Behind a hard-working quartet of SD40-2's, train 396 climbs out of St. Paul through Red Rock. Doing the honors are CP 6069, CP 5942, CP 5482 and SOO 6601. Description: CP 6069, SOO 6039, 4403, CP 5872 on #654 pulling out of the siding at Bangor East. Description: CSX Q623 brings 94 cars south. Description: Three units handle the odd move today of empty rock cars to Humboldt. Trailing are SOO 4509 and CP 5712. Description: CP and SOO heritage shine through in one shot. A favorite of mine. Description: An eastbound at sunset between Brooten and Belgrade. Description: An eastbound sits on the Detroit Lakes Sub waiting for a new crew outside Glenwood Yard. Description: The CP-BN transfer heads back to Saint Paul at Union Jct. 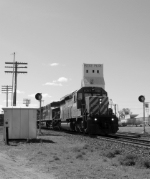 I caught this unit almost a year ago leading a rock train in Shoreview, MN. Picture taken from video. Description: The Saint Paul transfer hauls Eastward with a short cut, enabling the crew to isolate the 6069 leaving all of the work for the SD60. Description: ICE Train 171 Kansas City To St.Paul,Mn. A Dream come True, Train & Tow Boat in the same Photo. Title: CP 6069 River Sub. Description: ICE Train 171 CP-6069 ICE-6430, Rolls around Another Curve in the Mississippi Valley. Description: With a CP Multi-Mark SD40-2 leading, CP Train 170-01 yards its train at Joint Agency. Description: A late running 31J heads northbound through downtown Sunbury with seventeen loaded platforms. Description: Heading north through Riverside now the 165 makes good time heading for Binghamton. Description: Leaving a smoke and dust in its wake the 165 heads northward through Nescopeck. Description: An in your face view of CP 5691 shows its battered and beaten paint job however, 5691 still gets the job done as they keep working north. Description: Its getting dark as the 165 makes easy work of the small grade coming into Nanticoke. Description: The westbound D&H rolls through Hershey, running about 15 hours late. Description: CP 6069 leads a late running D&H 164/NS 30J eastbound through Swedeland with a trio of SD40-2's. Description: CP 6069 leads a trio of classic SD40-2's on D&H 164/NS 30J eastbound through Swedeland. Description: Pacman in reasonably good condition with a leaser on point of D&H 164-29 on the ex PRR high line. Description: Pair of "pacman" Canadian Pacific SD40-2's combine with a CITX leaser hauling D&H 164 stack/freight train westbound on the ex PRR high line.